It is a sad end to the career of one of the greatest players of the modern game. With 43 singles titles, including seven Grand Slams, an Olympic gold medal and over $20m in prize money, her achievements are almost unrivalled in the women’s game of tennis. 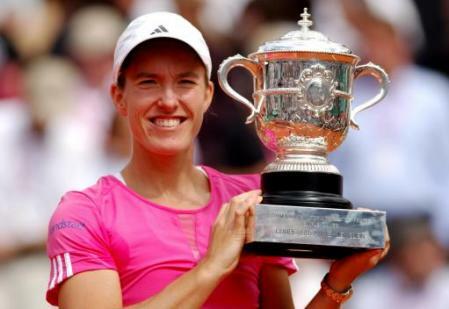 However, the elbow injury that she picked up in a fall at Wimbledon last year has ultimately brought a premature end to the tennis career of Justine Henin. She decided to return to tennis just over 12 months ago after regaining her love for the game and lured back by the one missing feather in her crown – a Wimbledon title. Her first match in over 18 months came in Brisbane in January where she defeated the world number 20, Nadia Petrova, in straight sets. The comeback continued to gain momentum and she progressed right through to the final, where she was eventually defeated by fellow Belgian, Kim Clijsters, who herself had recently returned from retirement from the game. All the focus was on Justine as she headed to the Australian Open and whether she could imitate Clijsters’ achievement of winning a Grand Slam on her return. The fairytale looked to be on as she cruised through to the final, dispatching world number five, Elena Dementieva, in the second round, and dropping just one game in hammering Jie Zheng in the semi-final. However, the formidable world number one, Serena Williams, stood in her path. Despite winning the second set, Serena proved too strong for Henin, but it had been a remarkable effort in only her second tournament in 18 months. Even more focus was on Henin when the clay court season came around. Before her first retirement, she had been virtually unstoppable on her beloved surface, having won the French Open title four times in five years, including consecutive titles in 2005, 2006 and 2007. In her first tournament back on clay, she picked up her first title in 26 months, beating Australia’s Sam Stosur in the final. Going into the French Open, she was the favourite to reclaim the crown that she had never properly lost. Comfortable victories over Pironkova and Zakopalova were followed by a hard-fought win over Maria Sharapova. However, she was stunned in the last 16 when Sam Stosur, whom she had beaten less than a month before, overpowered her, beating her in three sets. However, it provided extra time to prepare for her ultimate aim – Wimbledon. She cruised through her warm-up tournament in s-Hertogenbosch, dropping just one set on her way to the title. Coming into Wimbledon, the hype surrounding her was huge. Comfortable wins over Sevastova, Barrois and Petrova only served to fuel the fire. The round of 16 match pitted the two Belgians together – Clijsters and Henin. Since Henin’s return, Clijsters had won both their meetings, but Henin went into the match as the slight favourite. She was magnificent in winning the first set 6-2, but toward the end of the set, she slipped and fell on her right elbow. She continued the match, but it was clearly troubling her and she crashed to a three set defeat. After the tournament, it was diagnosed as a partial ligament fracture and the injury would keep her out for the rest of the year. She made her return at the 2011 Hopman Cup, despite revealing that the injury had not properly healed yet. However, she appeared to show no adverse signs as she won all of her games without dropping a set, including a victory over former world number one, Ana Ivanovic. Coming into the Australian Open, she was one of the favourites to take the title, but struggled in her opening match against Sania Mirza. A more straight-forward task against Elena Baltacha was passed with ease, but she fell in straight sets to Svetlana Kuznetsova in what would be her final ever match. Her retirement is a blow for tennis fans around the world, but her career has provided a huge number of great memories. Despite problems in her personal life throughout her career, she has rarely let them affect her on court, and anyone who has seen her play will agree that she was undoubtedly one of the best players of her generation. Her presence on court will be sorely missed in the coming months.